Marwe roller skis do not require a running in period. The skis are ready for use as soon as the skis have proper bindings attached to them. As the skis are have been paired at the factory and are identical, use the skis alternately on the right and left foot so that wheels wear evenly on both sides. Attach the bindings as described in the instructions accompanying the binding package. The outermost bulge of the heel should come level with the front edge of the mudguard With ski boots larger than Size 40, and 10-20 mm away With ski boots sized under 40. 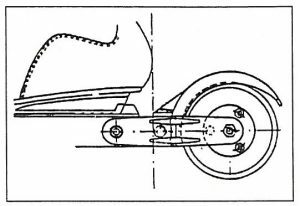 The corresponding dimensions for roller skis without mudguards are 15 mm and 25-35 mm, measured from the back end of the deck. The mounting holes for the ski binding can be made with a 44.2 mm drill. Use damp-proof glue, but use bi-component glue! If the roller ski pulls on the other side, open the nut (lenkkiavain 10) (16) of the front wheel and turn the wheel (8X) to the opposite direction. Go on turning the wheel with your other hand and tighten up the nut. If the adjustment of the front wheel does not help the situation, do the same for the rear wheel but turn the Wheel to the same direction where it pulls. Marwe as the manufacturer of your roller skis maintains a steady stock of spare parts for your roller skis for at least 10 years after the purchase. The normal maintenance required for the skis is keeping the skis clean using a soft rag. The roller skis bearings are well protected from both sides of the wheel, so they do not require any particular attention. If you want to extend the life of the bearings, clean the outside of the wheels after skiing on a wet or soiled surface, and lubricate the bearings if necessary. Wipe any superfluous streaks of oil of the wheel surfaces as they may soften the rubber. lf despite lubrication the bearing begins to seize, carefully remove the wheel from the ski shaft and the bearing and the inside bearing shield using a small screwdriver or spike. Wash the bearing carefully and lubricate with Vaseline. Replace the protective shield and reassemble the wheel. Do not wash the skis with a pressure washer! This can damage the XC range of skis frames and the skis bearings! The skis should be stored in a dark and cool place, Doing so you will ensure that the wheels will stay longer in good condition. Ensure even wear on your SKATING roller skis by interchanging the front and back wheels when the diameter of the back wheel has decreased by approximately 5 mm. Do not rotate the wheels during the change. 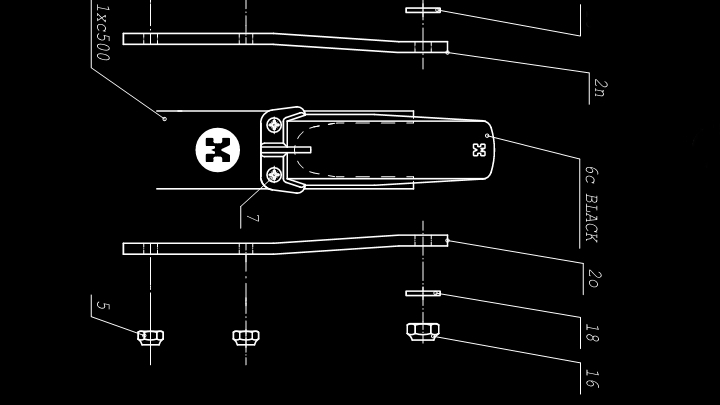 Take out the structure and spare parts diagram supplied with your skis. Open the lock nut (16) on the axle (15) and pull the axle (15) out from inside the wheel (8a or 8b) thus releasing the entire wheel (8a and 8b) and the washers (18) from between the fork Plates (2p and 2q). The bearing (12) washers (14c) will become detached from both sides. Press the toughened centering sleeve (13e) off with a steel spike of Ø 7.5 – 7.8 mm, which will also release the ball bearing (12). The rollers (8a or 8b) other bearing housing has a smaller tightness (compression fit) and therefore detachment should be commenced in that direction. Press the other bearing (12) off with a steel spike of Ø 10 – 12 mm. Press off the ratchet bearing (17) With a straight-headed steel spike of Ø 19 – 19.5 mm. Do not strike the ratchet bearing (17), as this may damage its thin steel shell. The ratchet wheel is at the front in the standard ski, but may also be transferred to the back. Assemble the ratchet wheel in the reverse order. lt is adviseable to service the bearings when the wheel is changed. lt is important that the axle nuts (16) are always on the right of the skier looking down. This ensures that the nut will not unlock if it is in contact with the ground. Tighten the nut (16) of the axle (15). Tightening it too much may damage the spin. Try with your hand to see if the grip has changed. If tightening the nut does not help, detach the wheel (8a or 8b) and detach the spacers from the wheel (14c). Roughen the flat surfaces of the washer (14c) with sandpaper or an abrasive band no. 60. Assemble the wheel and try the grip again. The grip of the front wheel may temporarily slip when skiing on a wet or slippery road surface. The wheel is changed in the same way as the ratchet wheel, except that the ratchet bearing is not present. The roller has an untoughened centering sleeve (13f). (8e and 8g): SKATING 500A, 610A, 620XC. Open the lock nut (16) of the axle (15b) and pull the axle (15b) out from inside the wheel (8g) which will release the entire wheel and washers (18) from between the fork plates (2n and 2o). The bearing spacers (14f) will be detached from both sides at the same time. Press off the aluminium centering sleeve (13g, (500A 13h)) With a Steel spike Ø 7.5-7.8 mm or poke the sharpened end of a pencil into the hole in the centering sleeve (13 g or (500A 13h ). Tap the blunt end of the pencil against the bench, which will detach the centering sleeve (13 g or (500A 13h ) and one of the bearings (12). Detach the other bearing (12) with a steel or wooden spike Ø 10 -12 mm. The free-spinning wheel is assembled in the reverse order. It is advisable to service the bearings when the wheel is changed. All the wheels for these skis are of the same hardness: USR, USO, US6, US7 or US8. The roller ski guarantee covers the ski material and possible manufacturing faults.The guarantee is in force from the day of purchase and continues for one (1) Year. The distance covered by skiing does not affect the guarantee period. Marwe will repair or exchange free of charge the part or parts which are found to have such an material or manufacturing defect which essentially affects the skis useability. The guarantee does not cover faults arising from normal wear or faults which are caused by outside factors. Claims under the guarantee or the product in its entirety should be submitted to Marwe at the cost of the sender. Such deliveries for which the correct transport charge has not been paid will not be collected. Marwe will pay for returning the product to the customer. Claims under the guarantee should give notice of at least the following information. sender’s address and contact information, date of purchase product, description of fault and of the circumstances in which the fault became apparent or arose, weight of the skier and the total distance travelled on the skis. Marwe is in no way responsible for direct or indirect damage or costs caused by use of the skis, unless it can be legally proven that it has been caused by gross neglect or malpractice by Marwe.